Gardeners farming on city lots find that local, organic food isn’t the only reward. 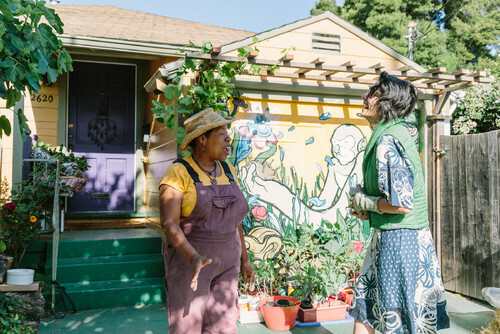 City farmer Wanda Stewart, left, chats with neighbor Jamie Morf in front of Stewart’s home in Berkeley, California. Morf had just picked up a dozen eggs from Stewart’s mini farm. “I want to give my money to the people who are growing my food,” Morf says. 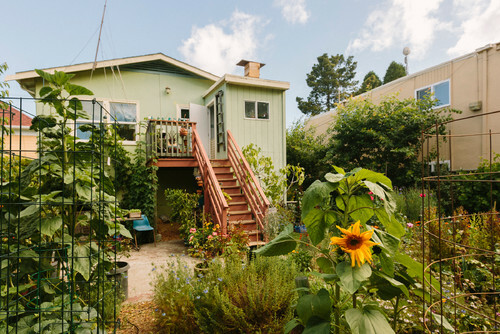 At 7:45 on a morning in May, Wanda Stewart is tending the mini farm at her home in Berkeley, California. 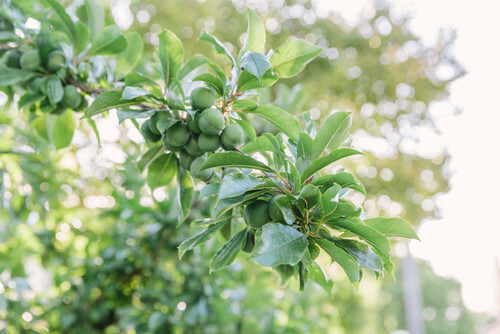 Chayotes, kale, peppers and fruit-laden lemon trees poke their heads over the picket fence. Pots of collard greens wait to be planted or distributed to neighbors. Birds chirp, a steady stream of kids on bikes ride by on their way to school, and Stewart’s dog, Angel, greets everyone who passes by with a friendly bark. 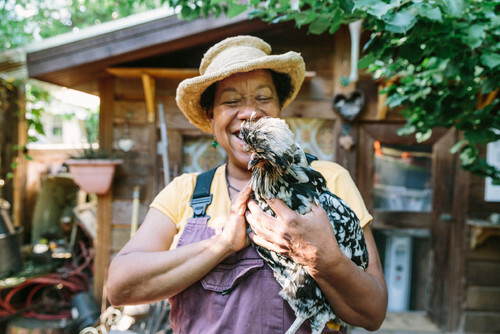 Stewart, who has grown produce and raised chickens on less than one-tenth of an acre in Berkeley for nearly a decade, is part of a wider community of urbanites around the world bringing agriculture back to the city. Apartments in a new Tokyo housing complex come with their own edible garden plots, New Yorkers are turning rooftops into mini farms, and a company in London is growing micro greens and salad leaves in underground World War II air-raid shelters. 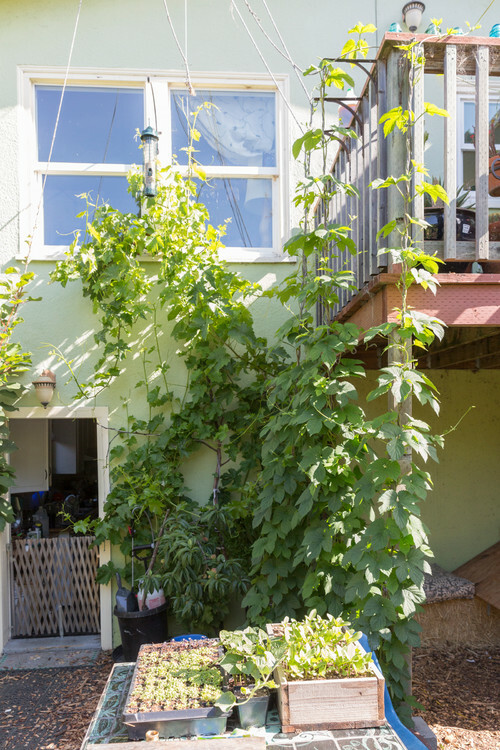 Cities on the east side of San Francisco Bay in particular are becoming known for industrious residents committed to using their yards to produce most of their groceries, from herbs and vegetables to eggs, milk and meat. Stewart’s front yard garden offers the best sunlight on her property for her crops. Her corner lot, with two sides exposed to the street, puts her close to many of her neighbors. Some city governments are seeing the advantages. “Many U.S. cities have been making strides toward supporting urban agriculture by offering affordable vacant land to lease, access to water, and land trusts to ensure land tenure for the future,” says Raychel Santo, a program coordinator with The Johns Hopkins Center for a Livable Future in Baltimore, and an urban gardener herself. Santo was also the lead author of a review released in May 2016 that highlighted the benefits and limitations of urban agriculture. “California passed some relatively innovative state-level policies to support the right to grow food for renters and members of homeowners associations, and provide tax incentives to encourage food growing on private land,” she says. San Francisco was the first city in California to incentivize food growing on private land. Berkeley allows homeowners to keep animals, including chickens, female goats and rabbits, without a permit if they comply with enclosure requirements and other municipal code regulations. In certain cases, animals can be kept in Oakland, California, as long as they are for personal use and don’t become a public nuisance. The demand for and availability of organic food are rising. The U.S. Department of Agriculture reports that three out of four conventional grocery stores in the U.S. now sell organic products. But a 2015 Consumers Reports study comparing 100 organic products with their conventional counterparts found ​that ​the organic items were, on average, 47 percent more expensive. These higher prices didn’t necessarily guarantee locally grown food. And when it comes to animal products such as meat and eggs, the pricing, labeling and sourcing can be challenging to navigate. High-quality, locally grown food was important to Stewart, but when she saw that the organic, free-range eggs at her local market cost $9 a dozen, she realized that she needed to rethink her food sources. She didn’t want to compromise on what she ate because it cost more. Since she couldn’t afford the food she wanted, she decided to grow it, starting with edible plants she liked and knew grew well in her neighbors’ yards. “I worked in their gardens, asked questions, watched and observed,” she says. 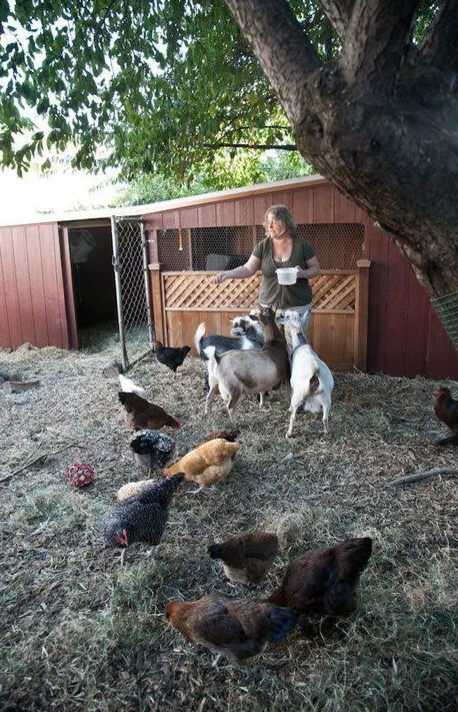 Kitty Sharkey feeds goats and chickens in her backyard in Oakland, California. A few miles away, Kitty Sharkey had started to question the meat she was buying after reading Michael Pollan’s book The Omnivore’s Dilemma. While she could afford organic produce in the San Francisco Bay Area, she couldn’t pay for meat that had been raised in a way she was comfortable with, and she didn’t want to cut meat out of her diet. Sharkey, who already grew herbs and vegetables at her east Oakland home, decided to dedicate most of her urban farming efforts and her one-tenth of an acre to raising animals, starting with goats for meat, milk and cheese. Quality food and humane treatment of the animals were her priorities. “Putting my first goat in the freezer was not very easy,” she says, “but it put me in control of [my meat source].” Now, several years later, she raises chickens and ducks, which she uses for eggs and meat; turkeys, which she uses for meat; rabbits, which she uses for meat and manure; geese, which act as her alarm system; pigs, which till her garden’s soil between seasons; and a sheep, which she uses for wool. “I believe having a positive relationship with city officials, and being open and honest about what I’m doing here, makes all the difference,” Sharkey says. It’s working, as she hasn’t had any official visits, issues or complaints in six years. Sharkey supplies about 95 percent of her own meat and all her eggs and milk products, minus butter, for 10 months of the year. On average, she produces 60 to 70 percent of her food for eight months of the year. Summer is the most productive season, she says, and she will preserve and can fruit and veggies in the summer to last through the year. 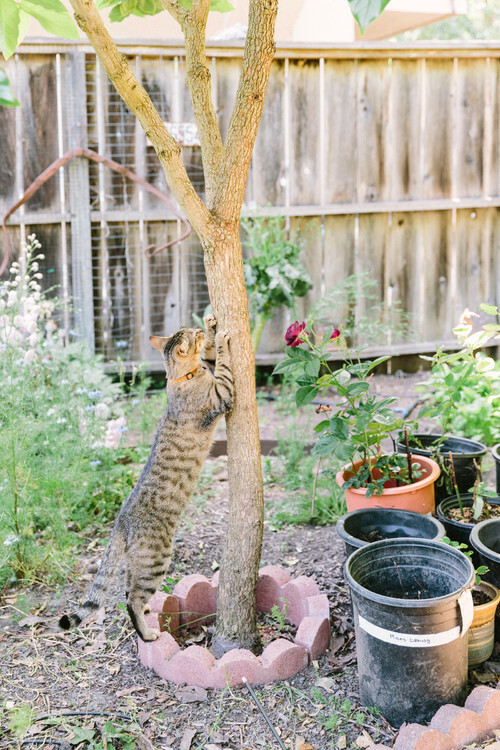 Ruby Blume grows fruit trees, herbs, flowers, and annual and perennial edible plants in her Oakland backyard. In addition to having progressive local legislation, the East Bay area sees continuous mild temperatures, which means an edible garden can produce food year-round. 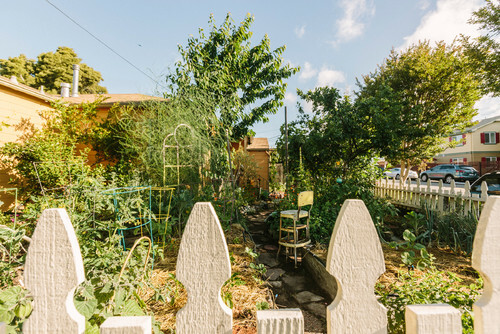 “I eat from my garden almost every day of the year,” says the Institute of Urban Homesteading’s Blume, who grew 400 pounds of squash, among other crops, in her north Oakland garden last year. She also raises rabbits for meat, and barters with other growers who share her food views. She never has to buy milk, cheese or eggs, and she grows 70 to 90 percent of her own fruits and vegetables from February to October. Blume stands in her backyard in front of growing cages for squash. Hops and grapevines grow up the walls in Blume’s yard, taking up little square footage. No garden is without its challenges, and anyone who has grown a tomato or lettuce plant knows the multitude of issues that can arise, from watering and sunlight to pests and soil, and can appreciate what it takes to produce just one vegetable or piece of fruit. Add small lots, close neighbors and compacted — or even contaminated — soil, and the true challenges of urban gardening reveal themselves. Stewart, whom we met earlier in her Berkeley front yard, soon discovered that her challenge would be finding the right place to grow things on her lot. “I gardened very successfully in the backyard for maybe one season, maybe two,” she says. Then the garden stopped producing. After some research and guidance from a neighbor, she realized that her soil’s nutrients were being washed away by the creek running under her yard. The existing shade trees were maturing, their expanding canopies blocking more of the six to eight hours of direct sunlight her plants needed. “It was very disappointing to have a productive bed for two growing seasons and then abandon it,” she says. Stewart’s backyard chicken coop houses the 20 chickens she raises for eggs. Sharkey’s vertical aquaponics system is filled with lettuce plants. The pond below supplies the lettuce with water and nutrients from fish waste through a recirculating system. The water runs through the tubing between lettuce tiers, moistening the soil and plants, which together clean the water before it returns to the pond below. Challenges inspire clever solutions. Stewart realized that her front yard was much sunnier than her backyard, and its soil much richer, so she relocated her efforts to the front, planting directly in the soil. The home’s previous owner had gardened and conditioned the clay soil, so crops started to grow right away. “I was really lucky that I inherited good soil,” Stewart says. From there, she planted fruit trees on the north side of the property so that they wouldn’t shade her sun-loving crops. She learned that lettuces like to grow in the shade of the fruit trees. She planted wildflower seeds near the edibles to attract pollinators, and she even allowed some greens to go to seed so that they would come back the next year. 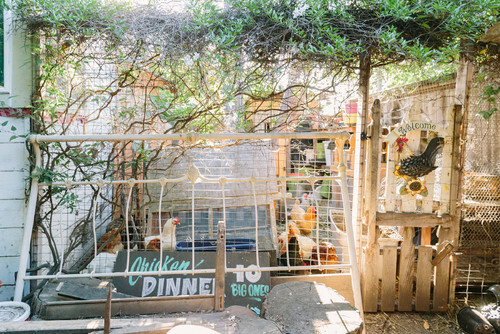 In her shadier, more private backyard, she installed a chicken coop for those fresh eggs she wanted. The gardeners have learned to use all aspects of their gardens to create something of a closed-loop system. Chickens, especially, help increase soil fertility with their manure, and they eat a lot of organic home and garden waste. Add irrigation innovations, such as Sharkey’s use of aquaponics, and Blume’s and Stewart’s heavy use of perennial plants that reseed and become more drought-tolerant, and the gardens start to sustain themselves. 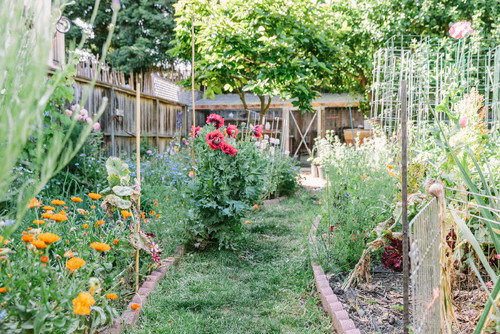 Sharkey’s front yard features plants that attract pollinators, and she has planted her parking strip with edibles such as beets and plum trees for her neighbors. 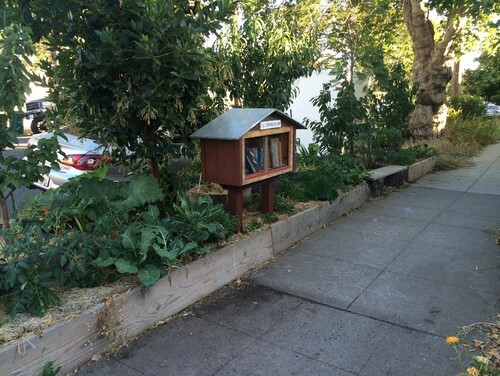 A Little Free Library offers free reading materials. A grass path winds through planting beds in Blume’s garden. 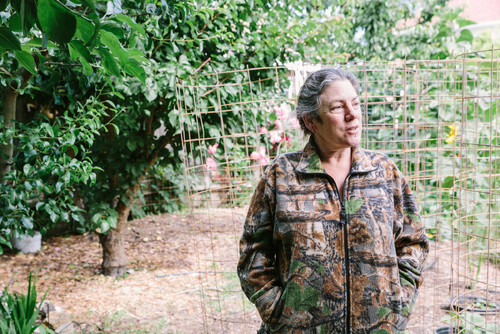 When Blume was establishing her garden in Oakland, she realized that the Bay Area was lacking a place for people interested in urban farming and traditional homesteading to come together and learn. That led her to found the Institute of Urban Homesteading nine years ago. The institute now offers 50 to 75 classes a year, with 10 or so people attending each class. People pay what they can afford, and classes are taught by instructors on subjects ranging from fermenting to planting a backyard orchard. Sharkey met Blume through a cheese-making class at the institute, where she now teaches classes on raising goats. The institute sponsors the garden tour on which Stewart is featured. As part of her gardening activities, Stewart, shown here, has volunteered in the gardens of local elementary schools, teaching kids the value of growing their own food. “I can plant seeds with them and hope they carry that into the future,” she says. 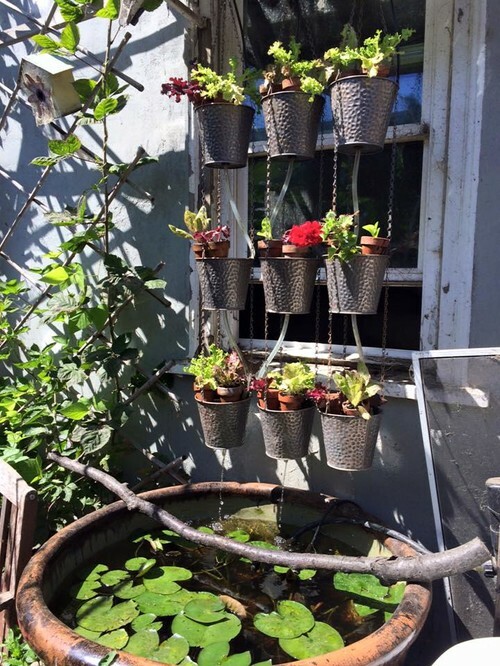 This article is from Annie Thornton of Houzz.